Hong Kong Tense As Democracy Activists Face Down Police : The Two-Way Thousands of protesters used umbrellas to deflect tear gas canisters as authorities tried unsuccessfully to break up demonstrations in the city's Central business district. Protesters march as they block the main street to the financial Central district, outside the government headquarters in Hong Kong, on Monday. Protesters at times numbering in the tens of thousands have gathered to demand the right to choose the territory's next leaders. Although Hong Kong's Chief Executive Leung Chun-ying has vowed not to send in the army, NPR's Anthony Kuhn says memories of the bloody Tiananmen Square crackdown 25 years ago, when Beijing deployed the People's Liberation Army against pro-democracy demonstrators, are not far from the protesters' minds. Even so, they have remained defiant. Chan Kin-man, a leader of Occupy Central with Love and Peace, as the group is formally known, said in an interview: "Only when the government makes a substantial response, then we will advise people to retreat. "They never talk to us directly. We are always ready for dialog and negotiation," Chan was quoted by Bloomberg as saying. Anthony, reporting for Morning Edition from Hong Kong's Central business district, describes "a sea of people" amid massive protests against Beijing that swelled over the weekend. "The demonstrations have spread to other areas including a shopping district and a heavily populated residential area. "Police said they used tear gas 87 times in clashes with protesters on Sunday. "On Monday, the government said riot police were being withdrawn as people had "mostly calmed down". "But some banks and schools were closed, and there was transport chaos." Anthony says: "What happened all during last night is that police tried to clear areas of the Central business district. "They sprayed pepper spray and protesters would ward it off with umbrellas. They would fire canisters of tear gas and the protesters would back off, regroup and come right back up to the front lines. So, in the end, it was the police who beat a tactical retreat," he says. 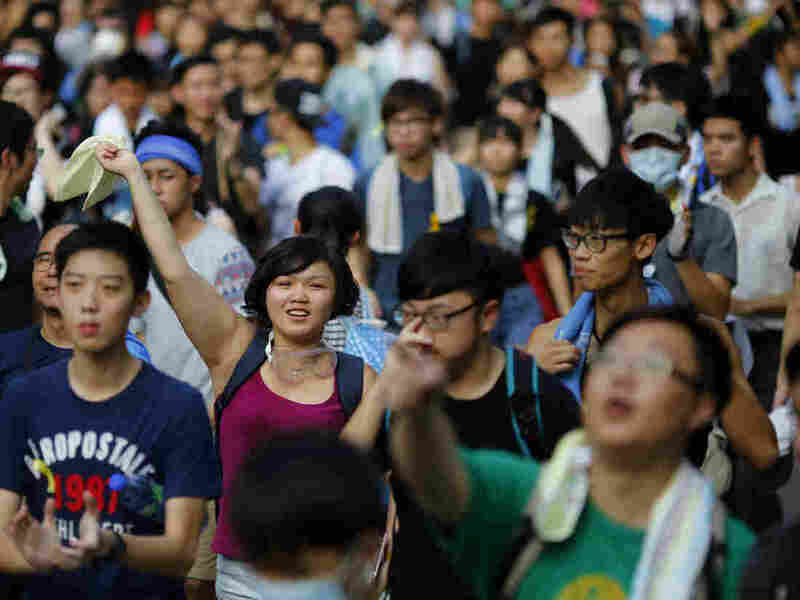 "Police officers tried to negotiate with protesters camped out on a normally busy highway near the Hong Kong government headquarters that was the scene of tear gas-fueled clashes that erupted the evening before. "An officer with a bullhorn tried to get them to clear the way for the commuters. A protester, using the group's own speaker system, responded by saying that they wanted [Chief Executive Leung] to demand a genuine choice for the territory's voters." 'Do something good for Hong Kong. We want real democracy!' he shouted." The largely independent South China Morning Post describes "standing room only outside Sogo [department store] in Causeway Bay, where numbers have just been boosted by a large student group." "Meanwhile Occupy Central co-organisers Benny Tai Yiu-ting and Reverend Chu Yiu-ming left the Tim Mei Avenue - the venue of occupation - for their first time since Sunday's early morning where they announced to the civil disobedience movement. "The duo won applause and cheers from the sea of protesters gathered at Harcourt Road. "Hang in there! Never give up," the crowd chanted." Anthony says that China has censored news of the protests in the rest of the country. On Monday, the Foreign Ministry described the demonstrations as being supported by "illegal movements." In a news briefing in Beijing, Hua Chunying, China's foreign ministry spokeswoman, said the Chinese government opposed to external interference in China's affairs by any foreign country, according to Reuters. "Hong Kong is China's Hong Kong," the spokeswoman said.